I’ve been back in Manila since Monday morning, and I’m now waiting for another flight out. I’ll just be gone for the weekend, to attend the Visayas leg of the Philippine Blog Awards, since I missed the main event in Manila. But this post is not about this trip, it’s about my last weekend in Penang. On Friday night, I met up with Wei and his friends and we went up Penang Hill. It has the highest peaks in Penang and it can be reached by riding the funicular train or if you’re looking for some exercise, you can do a 3-hour hike to the top. The train station is usually filled with people queuing to get in the trains, but that night, the station was deserted. We arrived just in time to catch the last train up, and have about 15 minutes at the peak before catching the last train back. I don’t know how the hill and the view look during the day, but at night it was gorgeous. Of course, the empty train and the cool temperature greatly helped. 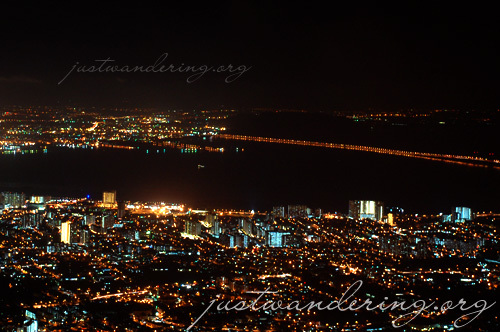 Still, the twinkling lights of the island, the Penang Bridge and Butterworth was breathtaking. From Penang Hill, we went down to Gurney drive for dinner. We had asam laksa, and they had me try the Chinese herbal jelly, a black jelly that had a slightly bitter after taste. It was oddly addicting and it eased the burning sensation the laksa left in my mouth. The night apparently still wasn’t over, and we drove to Batu Ferringhi to check out the night market and the beach. The market was meh, but the beach seemed nice. Well, as nice as a beach would look under the glare of powerful flood lights. 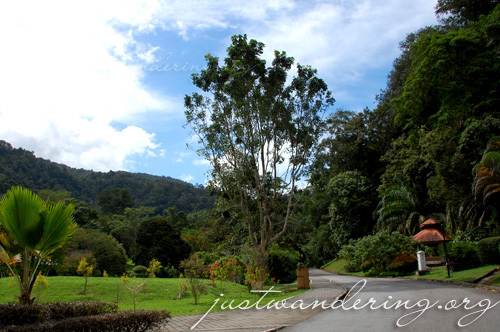 On Saturday we went to the Penang Botanic Garden, on the way to the waterfalls in between Balik Pulau and Teluk Bahang. The gardens was pretty, and the weather was perfect (though a bit too warm for my liking). Still, the sun was out, the sky is blue and there was a cool breeze flowing through the trees. 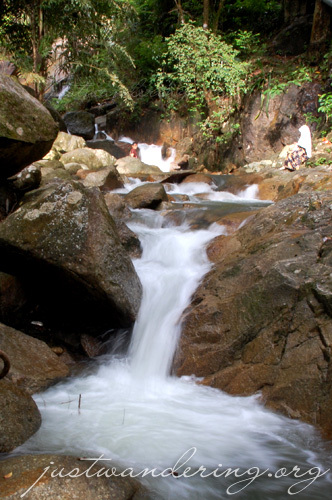 The waterfall, called Air Terjun Titi Kerawang (Filipinos, please stop snickering). The entrance is right beside Route 6 in Jalan Teluk Bahang. From the road, you have to walk through a path that takes you to the foot of the waterfalls. 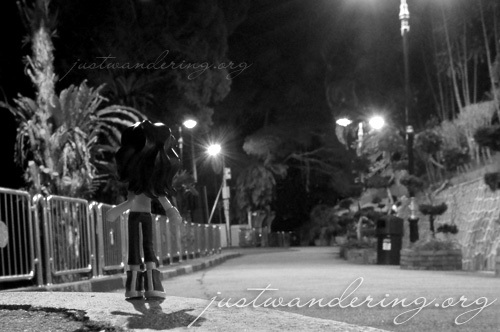 It was a lovely and relaxing place, and after walking around Georgetown, it was great to be surrounded by nature. From the waterfall, we headed to Balik Pulau, which translates to “back of the island.” We drove up to this lookout point, where you can get a gorgeous view of the town below and the sea beyond. It also faces West, so it should be lovely during sunset. 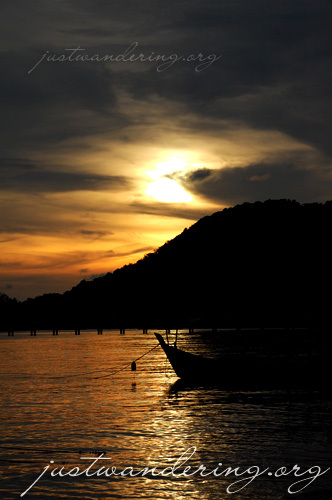 From the lookout point we drove down to the seaside, in Kampung Nelayan, a fishing village in Teluk Kumbar for dinner. We feasted on fresh seafood, including fried mantis shrimp, which interestingly is neither a shrimp nor mantis (which explains why it doesn’t taste like shrimp). After dinner, they took me to Queensbay Mall in Bayan Lepas to look for gifts for friends who celebrated their birthdays last week. 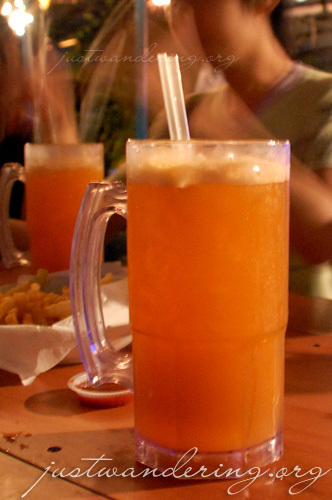 From there we drove and drove and drove until we got lost and ended up in this place that serves David Beckham. They have this selection of fruit and vegetable coolers named after celebrities, and I picked mine purely because…well, it’s David Beckham. He was made with orange, carrot, celery and some other vegetable. It sounds pretty weird on paper, but it was actually pretty good. David Beckham tasted like celery, if you want to know. David Beckham was so thick I can hardly wrap my hands around him. He was big and hard and tasted like celery. 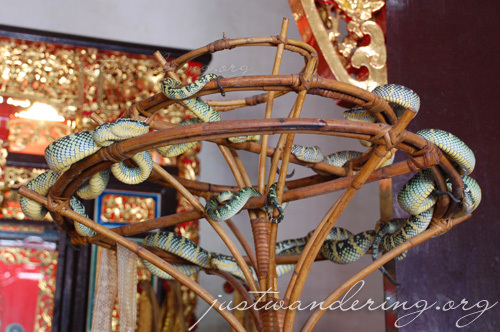 My flight back to Bangkok was on Sunday afternoon, and much to my consternation, Wei wouldn’t let me leave Penang without going to the Snake Temple. The name alone should give you an idea of what to expect in the temple. The temple was built in honor of Chor Soo Kong, a Buddhist monk who is revered as a deity. He was also a healer and said to have given shelter to snakes in the jungle. Story goes that when the temple was built, snakes flocked to the temple in their own accord and never left. From the outside, the temple looks like your typical Chinese temple. Inside, it maintains the same architecture and features the same elements found inside other temples with one stark difference: the snakes. The venomous pit vipers are resting on wooden… things at the altar. They don’t seem to be moving, which was fine with me. The venom has been removed, but visitors are still advised against picking, prodding, poking and uh, provoking the snakes. After the Snake Temple, we killed some time doing something so utterly local: we went to the supermarket. It was the Giant Hypermarket, actually. Though it may seem weird to be going there, it was a pretty good choice. Apart from the fact that it’s airconditioned, I was able to buy a pack of Horlicks (the only place where I can get Horlicks ais in Manila is Toast Box and it’s ridiculously expensive at Php89 or MYR 6.40) and much to Rotch’s glee, a Liverpool FC cellphone charm bearing Fernando Torres’ number (to match the number 8 Steven Gerrard charm I got her from Cameron Highlands). I was able to check into my flight two hours before departure and had plenty of time to kill before boarding. Much to Wei’s dismay, I chose to have my last meal in Penang at McDonald’s. I love Malaysian food and the food in Penang is just wonderful, but after a week, I’m quite content to have something relatively bland in comparison. My week in Penang has been awesome. I was happy with my decision to go back and take my time exploring Georgetown. I quite lucky to have the chance to explore the other side of the island, luckier still to know Wei (and to get to know his friends who were nothing but hospitable). I love how there was no need to rush things and cramming everything in just a couple of days. Future trips should all be like this, I think. I finally finished writing this entry 12 hours after starting it. Some parts of the entry were written on the plane, and it was finally finished in Cebu.